Recommended citation: Farag J, Marasco S. Right Heart Failure in Left Ventricular Assist Device Patients. OBM Transplantation 2019;3(2):18; doi:10.21926/obm.transplant.1902060. Left ventricular assist devices (LVADs) improve quality of life in end-stage heart failure patients but a frequent complication is Right heart failure (RHF) causing significant morbidity and mortality. This review article discusses key issues that need to be considered in the assessment and clinical management of RHF in LVAD patients including the use of Right Ventricle (RV) support devices and off-label LVADs as temporary or permanent RV support. Left ventricular assist devices (LVADs) are utilised in refractory end-stage heart failure. These devices are used as a bridge to transplant, destination therapy, and occasionally as a bridge to recovery . Right heart failure (RHF) is a frequent complication with significant mortality and morbidity . Right ventricular failure (RVF) leads to poor filling of the left ventricle (LV), and thus insufficient flow to the left ventricular assist device. This subsequently leads to inadequate flow from the LVAD itself, and the patient will suffer from the sequelae of both right and left heart failure, culminating in end-organ malperfusion and central venous congestion. The Interagency Registry for Mechanically Assisted Circulatory Support (INTERMACS) defines right heart failure as signs and symptoms of persistent right ventricular dysfunction following LVAD insertion. This is stratified into mild, moderate, and severe according to inotrope therapy duration (≤7, 8-14, and >14 days, respectively) . However, this definition is limited to patients left unsupported mechanically post-procedure, and is retrospective in nature. In patients with severe RVF following LVAD insertion, it may indeed be fatal to leave them without definitive mechanical support. Right heart failure signs in patients fitted with an LVAD reflect the physiologic sequelae expected. These include elevated right atrial pressures with a relatively low left atrial pressure, poor LVAD filling, and low systemic blood pressure. It is important to note that high left atrial pressures in conjunction with high right atrial pressure and low cardiac index may suggest LVAD inflow obstruction, which may be due to thrombosis of the inflow cannula, and should not be confused with RVF. This is often found in conjunction with increased LVAD power output. The physiological changes of RVF can all be determined by pulmonary artery catheter measurements. Echocardiographic findings will demonstrate poor right ventricular ejection, whilst also demonstrating whether the LVAD inflow is obstructed . Biventricular assist devices (BiVADs) are utilised where an LVAD alone would be insufficient therapy due to the significance of the right heart failure. This configuration is simply a permanent right ventricular assist device (pRVAD) inserted in conjunction with an LVAD. However, this must be weighed against the significantly higher morbidity and mortality of BiVADs when compared with LVADs. In fact, Kirklin’s review of the INTERMACS database published in 2008 found that BiVADs had twice the mortality rate of LVADs . Similarly, in the 7th INTERMACS annual report, it was found that BiVAD recipients had a 50% survival at 12 months compared with 80% in LVADs . Although this may be a reflection of an overall more unwell pre-operative condition of the patient rather than the device itself, Cleveland found that BiVAD recipients had a significantly higher rate of infection, bleeding, and device failure than LVAD recipients . Yet, a planned permanent RVAD has been proven to be of greater benefit than delayed placement of an RVAD in LVAD recipients. Fitzpatrick et al (2009) found that in a cohort of 99 LVAD recipients, planned RVADs had a superior survival to delayed RVADs, and a trend towards improved bridging to transplantation. However, the two groups had no significant pre-operative differences that would help differentiate them . This reiterates the difficulty in the choice of LVADs and BiVADs. The single device - LVAD alone - has better survival, less morbidity, and improved quality of life; yet a failure to implant the more complex device early - a planned BiVAD - has significant negative consequences. In patients with an LVAD, there are a multitude of haemodynamic and anatomical changes that occur which have potential to affect the right ventricle. In the pre-operatively impaired right ventricle, there is potential that these changes cause systemic cardiovascular compromise. These changes by the LVAD can be grouped into effect on right ventricular preload, afterload, and anatomical function [5,9,10,11]. With the insertion of an LVAD in a previously failed heart, there is a sudden increase in the volume ejected into the systemic circulation. This is followed by an increase in venous return from the end-organs to the right atrium, and thus an increase in preload. Hence, the workload upon the right heart has increased rapidly between pre- and post-LVAD implant phases. In an otherwise normal pulmonary vascular system, the unloading of the left ventricle should subsequently unload the pulmonary vasculature. Hence, any pre-existing passive pulmonary hypertension secondary to left heart failure would be alleviated, and right ventricular afterload would decrease. However, in a pulmonary vasculature compromised by obstructive disease (atherosclerosis or emboli) this would have the opposite effect. The increase in preload to the right ventricle previously described would further elevate pulmonary pressures that are not unloaded by the LVAD, as the pulmonary hypertension is not secondary to left heart failure. Ventricular interdependence has been described by Santamore et al (1998) as ‘the forces that are transmitted from one ventricle to the other through the myocardium and pericardium, independent of neural, humoral, or haemodynamic changes’ . This concept has been studied in animal and other laboratory experiments, concluding that reduction in left ventricular output led to 20-40% reduction in RV systolic pressure and output [13,14,15]. The mechanism behind this is believed to be related to the orientation of muscle fibres in the right ventricle (non-concentric), and the assistance the septum provides - essentially as an anchor - against which it contracts. Interventricular septal deviation to the left occurs with LVAD placement (Figures 1 and 2). This is due to the volume being unloaded by the device and displaced directly into the ascending aorta via the conduit. This has been shown in various studies utilising ultrasonic crystals and echocardiography . Although this shift may lead to better compliance, it also impacts the contractility of the right ventricle. The unnatural leftward bending of the septum has consequent pathologic compression of myocardial fibres on the RV side of the septum . Hence, an LVAD will subsequently have a detrimental effect on right ventricular ejection. In summary, in patients with an LVAD, unloading of the left ventricle alters the size and shape of the right ventricle (in particular the interventricular septum) as well as affecting the haemodynamic flow before and after the RV. Hence, an increase in workload and distortion of anatomy and functionality of the right ventricle is thought to be a major contributor in unexpected RV failure with LVAD implantation [5,9,10,11]. Certain pre-operative characteristics of right ventricular dysfunction may provide clues as to which patients cannot compensate for these changes. 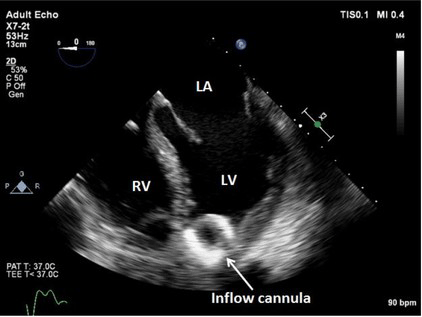 Figure 1 Trans-esophageal echocardiography showing movement of interventricular septum to the left with inflow cannula of LVAD in situ . Figure 2 Midpapillary (A) and long axis (B) biventricular imaging demonstrating optimal shape of RV in the LVAD patient . Although infrequent in all cardiac surgical procedures with an incidence of 0.04-0.1%, acute refractory right ventricular failure occurs in 20-50% of LVAD insertions [15,19,20]. This complication is becoming increasingly more frequent with more marginal candidates having LVADs implanted, and the device being utilised more frequently . RHF post-LVAD has a significant post-operative mortality. Dang et al reported a more than 3 fold early mortality (≤30 days) in LVAD patients who were complicated with RHF than those who were not (19% vs 6.2%; p = 0.037) . Kormos et al (2010) also reported that survival to transplant was significantly lower in patients suffering RHF post LVAD insertion) . Survival to transplant, recovery, or ongoing device support at 180 days was 71% in those with RHF, compared with 89% in those without (p < 0.001) . Similarly, there is a known increase in overall morbidity. Delayed rehabilitation, increased transfusion requirements, and delayed or failed restoration of end-organ function have been associated with RVF post-LVAD insertion . Independent assessments of right heart function, such as RV ejection fraction, CVP, and TAPSE are not alone adequate to distinguish right heart failure [22,23,24]. As preload is reduced with left heart failure, right ventricular dysfunction can be masked, and is often more obvious once the LVAD is inserted. The LVAD insertion also significantly impacts upon ventricular interdependence as described previously, exacerbating an impaired right ventricle. Several features have been identified as risk factors for right heart failure post-LVAD insertion including end-organ dysfunction, non-ischaemic cardiomyopathy, and severe TR . More complex scoring systems have been developed and analysed to predict right ventricular failure following LVAD implantation. These scoring systems were developed in retrospective cohort studies utilising logistic regression scoring of blood, echocardiographic, and right heart catheter results. Some of the more common scoring systems will be discussed below [22,24,25,26]. Published in 2008, Matthews et al used multivariate logistic regression on a sample of 197 patients whom underwent LVAD implantation . 68 patients suffered right heart failure, and the pre-operative findings were analysed to determine significant risk factors. A vasopressor requirement, elevated ALT, bilirubin and creatinine were all independent predictors of RHF. Furthermore, a scoring system was formulated to determine an odds-ratio for RV failure. Below is the scoring allocation as well as the scoring system (Table 1 and Table 2). Table 2 RVF risk (Matthews’) score. Based upon the above, the sensitivity and specificity of these scores was 83% and 80%, respectively. 96% of patients that scored < 30 underwent successful LVADs, whilst 89% of patients scoring ≥ 65 required BiVADs. A score of 2 or more provided a sensitivity of 84%, specificity of 63%, and negative predictive value of 93%. That is, a score less than 2 predicted successful isolated LVAD therapy in 93%. The above scoring systems have some limitations. Cardiac index and RVSWI require invasive tests such as a right heart catheter - not readily performed in the acutely unwell patient. Furthermore, a patient on ECMO may not project accurate right ventricular and tricuspid function on echocardiography (Table 3). Table 3 Atluri’s (CRITT) score. These scoring systems have been shown in their publications to be highly sensitive, yet not all are particularly specific and thus it can be difficult to justify the expense, morbidity and mortality associated with a second VAD. None of them have been validated in prospective studies. Finally, these scoring systems do not determine which patients will be sufficiently managed with a temporary device compared with permanent support. The sensitivies and specificities of each scoring system are outlined in Table 4. Table 4 Comparison of scoring systems. The management of RHF following LVAD insertion can begin pre-operatively, with the intent of prevention. Pre-operative management is aimed at reducing large volume shifts, particularly with the use of blood products which may cause volume strain. Monitoring of right ventricular function pre-operatively is suggested in those who are deemed high risk . A pulmonary artery catheter can provide accurate assessment of RV function and pulmonary vascular resistance (PVR) and allow titration of inotropes and pulmonary vascular dilators. Dobutamine and milrinone are agents commonly used for right heart optimization. These inodilator agents are often used in conjunction with other pulmonary vascular dilators such as iloprost and inhaled nitric oxide (NO). Norepinephrine is also a useful adjunct to maintain perfusion pressure to the right coronary artery, as well as end organs. Aggressive diuresis assists in lowering central venous pressure, reducing end organ venous hypertension, reducing right ventricular strain and normalizing right ventricular geometry. A large double blinded, randomised control trial encompassing centres in Germany and the US investigated whether inhaled nitric oxide (NO) was of benefit in the LVAD population . Unfortunately, it did not prevent RV failure post-operatively, despite decreasing mean pulmonary artery pressures (mPAP) and increasing LVAD flows. Several small studies have evaluated the use of milrinone, inhaled nitric oxide, and phosphodiesterase inhibitors in optimizing right heart function [27,28]. Although these studies demonstrate reduction in pulmonary artery pressures and improved RV echocardiography findings, they are small sample sizes and do not exclusively evaluate use of these agents in the pre-operative period. Good peri-operative technique with the intent of reducing unnecessary blood loss, reducing CPB time, and good myocardial protection are all vital in protecting against post-operative RVF. Maintaining perfusion pressure peri-operatively, avoiding air embolism down the right coronary artery, and not expecting the right heart to deliver high flows immediately are useful protective strategies. Several publications have reported the outcome of concomitant tricuspid valve surgery (TVS) for severe TR at the time of LVAD implantation. 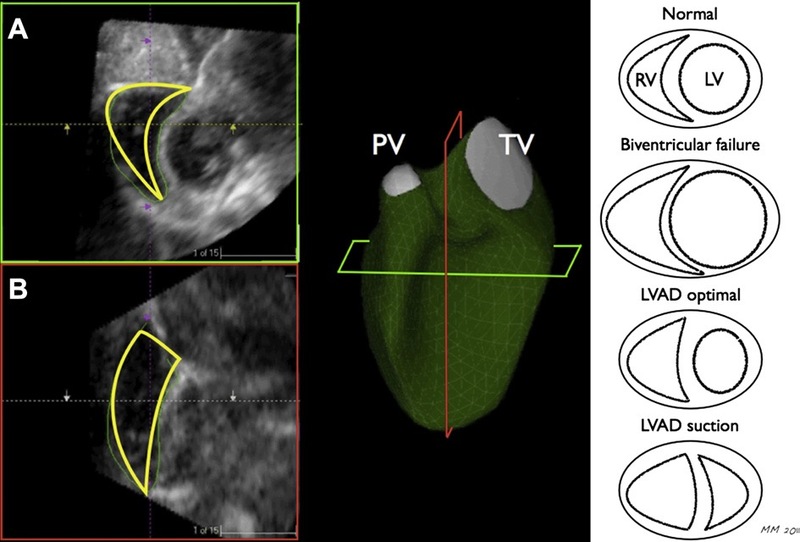 Tricuspid regurgitation (TR) is often secondary to RV and TV annular dilatation in LVAD recipients, reflective of the chronicity of their heart failure. Furthermore, the geometric changes to the septum by the LVAD are thought to contribute to worsened TR . Significant TR has been found to be associated with right heart failure following LVAD implantation . Hence, the reasoning for TV repair or replacement to prevent post-LVAD RVF has been reported in several publications. A systematic review and meta-analysis on concomitant TVS by Dunlay et al was published in 2015 . They reviewed 6 papers comparing the outcomes of LVAD+TVS versus LVAD alone. No paper found any difference in mortality. Additionally, pooled analysis found no difference in need for RVAD, whether concomitant TVS was performed or not. A subset analysis evaluated the 3 publications which selected patients with moderate and severe TR only, and no difference in need for RVAD post-operatively was re-affirmed. Although a link exists between significant TR and post-operative RVF in LVAD recipients, tricuspid valve surgery may not be enough to prevent the need for mechanical right-sided support. Phosphodiesterase inhibitors including milrinone and iloprost have been shown to improve right heart function in the peri-operative period. Hamdan et al reported on the use of sildenafil in 8 of 16 patients with RVF and pulmonary hypertension receiving LVADs. Patients also received nitric oxide. This small population was shown to have significantly improved PVR, pulmonary artery pressure, trans-pulmonary gradient (TPG), cardiac index, and other measurements of right heart function . Once again, the use of multi-modal therapy with careful monitoring is likely to be most beneficial. Pulmonary artery balloon pumps have been utilised for short periods of time, although with limited success . The main mechanical options are a temporary right ventricular assist device (tRVAD) and permanent RVAD. It is important to note that there is no specific mechanical right ventricular device - all permanent RVADs utilised are off-label use of devices designed as LVADs. Various tRVADs exist on the market currently, or are used as such. LoForte et al describes the use of a CentriMag™ device as a temporary right ventricular device , whilst Aissaoui reports on both Thoratec PVAD and CentriMag™ at different times for temporary right ventricular support . The CentriMag™ is a magnetically levitated radial pump, and is utilised as a temporary device for either left or right ventricular support. It has been approved for use up to 30 days in either position. In its form as a tRVAD, the inflow cannula lies in the right atrium, whilst the outflow cannula is in the main pulmonary artery . The Impella RP™ device has recently been described for use as a temporary RVAD by Anderson et al (2015) in the prospective RECOVER RIGHT study . The Impella RP™ is a 22Fr catheter-based percutaneous micro-axial pump mounted on an 11Fr catheter. The catheter is advanced via the femoral vein into the pulmonary artery, with the pump traversing the tricuspid and pulmonary valves. The pump’s inflow is positioned in the IVC and the outflow in the PA, able to expel blood up to 4l/min. Its intended use is up to 14 days. In the 2015 non-randomised trial, 30 patients were recruited and divided into 2 cohorts: patients suffering RHF post LVAD insertion (n = 18; cohort A) and patients who had RHF post-cardiotomy or post myocardial infarction (n = 12, cohort B). Anderson reported a 70% survival to discharge of both cohorts combined, and although not statistically significant, a higher survival to discharge in cohort A (77.8% vs 53.8% in cohort B). In 2018, Anderson reported on sixty patients in a prospective study dividing patients into the same two cohorts as the 2015 study . Cohort A (RVF post-LVAD) had 31 patients, and Cohort B (post-cardiotomy RVF and post myocardial infarction RVF) had 29 patients. Once again, survival to discharge or at 30 days (whichever was longer) was 77.4% in Cohort A, and 73.3% overall. In short, the Impella RP is a novel method for right heart support and appears to be a useful support strategy for LVAD patients with post implant RHF. The TandemHeart is a ventricular assist device that has been proposed for use in left heart failure. However its use has been proposed by Schmack et al (2016) as a right ventricular assist device in conjunction with an LVAD . They proposed that the cannula is placed via the right internal jugular vein via a Seldinger technique over a previously inserted Swann-Ganz catheter. The outer cannula (29Fr) is positioned in the RA (under TOE guidance) and the inner cannula (16Fr) in the pulmonary trunk. There are no clinical reports of this device’s use as a temporary RVAD as yet. An alternative temporary support consists of a modified ECMO circuit, with the oxygenator removed. Temporary RVAD support is provided by a Biomedicus centrifugal pump (Figure 3). A 21 French inflow cannula is inserted via the femoral vein, with the tip of the cannula in the proximal IVC or right atrium. The return cannula is via an 8mm Dacron graft sewn end-to-side to the main pulmonary artery. This is tunnelled from the thorax to exit the anterior abdominal wall . Weaning of the tRVAD is performed in the intensive care unit, where LVAD flows and haemodynamic and echocardiographic parameters were monitored. A patient is deemed suitable for decannulation if weaning studies are successful, then placed back on full flow until decannulation. Decannulation can be performed in either the ICU or operating room depending on whether return to the operating room is necessary for other reasons, such as evacuation of mediastinal clot. The access femoral cannula is removed and manual pressure applied. The return line is decommissioned by removing the 21Fr cannula, withdrawing the Dacron graft sufficiently to expose a sterile portion, clamping, dividing and oversewing the graft and letting it retract back into the chest [36,37] (Figure 4). Figure 4 Centrifugal pump as an RVAD. Saxena, 2015 . An alternative to temporary RV support with an LVAD, is the insertion of a permanent RVAD. In this case, a patient would be discharged with a BiVAD (two permanent devices) as opposed to an LVAD, alone. As mentioned previously, early permanent RVAD insertion has been shown to have lesser mortality, morbidity, and successful bridging to transplant than if implanted secondarily - i.e. following failure of temporary support. Clear guidelines as to the institution of tRVAD or pRVAD at the time of LVAD insertion are lacking, and thus the decision making is inconsistent across centres and surgeons. Temporary RVAD is preferred as a single device on discharge has lesser morbidity and mortality , whilst the cost of biventricular permanent devices is significant. Yet readmissions for heart failure and complication rates suggest that this cost-saving decision may be flawed. Similarly, a tRVAD may not in fact have a lower mortality and morbidity compared with a pRVAD [35,38], and a planned insertion of a pRVAD has superior survival and reduced morbidity than an unplanned insertion . The patients were all deemed to have a high risk of RV failure post LVAD insertion according to 3 different scoring systems: the Matthews’, Fitzpatrick’s, and Berlin scores. Furthermore, there was no significant difference in the scores between those whom received temporary or permanent RV devices. The only significant difference between group A and B was the presence of an IABP (76% vs 55%, respectively; p = 0.05), whilst all other demographic and pre-operative data were similar. Interestingly, the stratification of patients for BiVAD or tempRVAD/LVAD was determined by the patients. All 46 patients in group A were worked up and planned for BiVADs, but were given the option of temporary RVAD support when they refused. Hence, patient preference distinguished which device was utilised. Loforte found that survival to discharge was the same across the two major groups (56.5% vs 54.8%; p = 0.56). Similarly, 90 day and 6 month survival were no different. In fact, the most distinct findings in the study were between planned and unplanned temporary RV support (group A1 vs A2). Survival to discharge was better in the planned group (A1 57.1%, A2 45.4%; p = 0.04). A higher number of patients died whilst on support when tRVADs were delayed (A1 20%, A2 45.4%; p = 0.04), and were less likely to be weaned from their RV support device (A1 71.4%, A2 45.4%; p = 0.02). Aissaoui et al performed a retrospective study on 173 patients from 2000-2011 whom received LVADs with a right ventricular device . Amongst this group, 84 received BIVADs and 87 had LVAD with therapy for RV failure. Of these, 57 had LVAD combined with tRVAD, and 32 had LVAD with medical therapy for RHF. RV failure was defined as the need for a temporary RVAD, or inotropic therapy for more than 14 days post-LVAD insertion. The only differences across the groups were that BiVAD patients were younger than those who received medical therapy or temporary RVADs (50 vs 54yo; p = 0.011), as well as having a higher pre-operative CVP (15.8 vs 11.1mmHg; p = 0.005). Mortality was seen to be significantly higher in the BiVAD group within 48 hours of surgery (8% vs 0%; p = 0.005). However, as with Loforte’s findings, 6 month survival was no different between the BiVAD and non-BiVAD groups (52% vs 43%; p = 0.71). Importantly, survival to discharge was not reported. Other differences were readmission for device related infections (26% BiVAD; 15% LVAD with RVF) and overall neurological complications (BiVAD 37%, LVAD with RVF 20%; p = 0.002). Unfortunately, there was no direct comparison of temporary and permanent RVADs in this case, with medical therapy grouped along with the temporary devices when comparing outcomes. The current literature does not outline which patients would benefit from temporary over permanent RV mechanical support, and how to differentiate them. This is an area of ongoing research, and clear guidelines are lacking. Right heart failure has been recognised as an independent risk factor of poor outcome pre- and post- heart transplantation. The presence of an RVAD in conjunction with an LVAD has been found to be a risk factor for reduced survival to transplantation. Ochiai et al reported in 2002 on 245 LVAD-recipients . 9% of the cohort necessitated a permanent RVAD, although no comment was made upon RVF post-LVAD insertion that did not require a permanent RVAD. Nevertheless, survival to transplant was significantly less in patients who had a RVAD (17% vs 74%, p < 0.001). Baumwol reported in 2011 on 40 LVAD recipients and their survival to transplant . They noted that survival to transplant was significantly impacted by LVAD recipients complicated by post-operative right heart failure 54.5% vs 90.9% (p = 0.027). Of the 13 patients who had post-LVAD RVF, only 3 received mechanical support in the form of a temporary RVAD. No comment was made on whether patients had a permanent RVAD inserted thereafter. Ravis et al retrospectively analysed 221 patients in their centre on the waiting list for heart transplantation . Initially categorised HE1 (highly-emergent category 1) - patients transpanted within 8 days of listing) patients were excluded in order to identify patients on a waiting list. This study reported that 47 candidates died whilst still on the waiting list (21.3%). Multivariate analysis determined that the only independent risk factors associated with waiting-list mortality was an LVEF<30% (HR 3.76, 95%CI 1.38-10.24; p = 0.01) and severe right ventricular failure (HR 2.89, 95%CI 1.41-5.92; p = 0.004). Once again, severe RVF (pre-operatively) was identified as an independent risk factor for post-transplant mortality on multivariate analysis (HR 5.38, 95%CI 1.38-10.24; p = 0.02). Importantly, only 19 patients had an LVAD pre-transplant (8.6%). The literature clearly demonstrates that the need for a permanent RVAD and/or the presence of RV failure significantly impairs survival to transplant and even post-transplant outcomes. More data needs to be gathered to identify whether permanent or a temporary device will impact survival differently. Right ventricular failure is a common complication, to some degree, following LVAD insertion and is a major cause of morbidity and mortality. It has also been found to reduce survival to transplant. The pathophysiology is complex, and, as such, the indication for a concomitant RVAD is not always clear. Several scoring systems exist that aim to predict RVF in hope of preventing the poor outcomes of a late RVAD insertion. These have yet to be validated in prospective cohort studies. Furthermore, they often require comprehensive assessment utilising right heart catheterisation and echocardiography – not always possible or accurate in the acutely unwell patient on ECMO. The role of temporary RVADs has been utilised more frequently in its various forms in more recent times. Its use has been driven by the desire to reduce morbidity and improve survival to transplant by avoiding biventricular devices. Although survival in the short-term has been comparable between permanent or temporary RVADs (amongst LVAD-recipients), overall morbidity and survival to transplant has not yet been shown to be advantageous. Further research needs to be performed to assist in guidelines to clarify guidelines for temporary versus permanent mechanical support in the LVAD-recipient. Flores AS, Essandoh M, Yerington GC, Bhatt AM, Iyer MH, Perez W, et al. Echocardiographic assessment for ventricular assist device placement. J Thorac Dis. 2015; 7: 2139-2150. Argiriou M, Kolokotron SM, Sakellaridis T, Argiriou O, Charitos C, Zarogoulidis P, et al. Right heart failure post left ventricular assist device implantation. J Thorac Dis. 2014; 6: S52-S59. Haneya A, Philipp A, Puehler T, Rupprecht L, Kobuch R, Hilker M, et al. 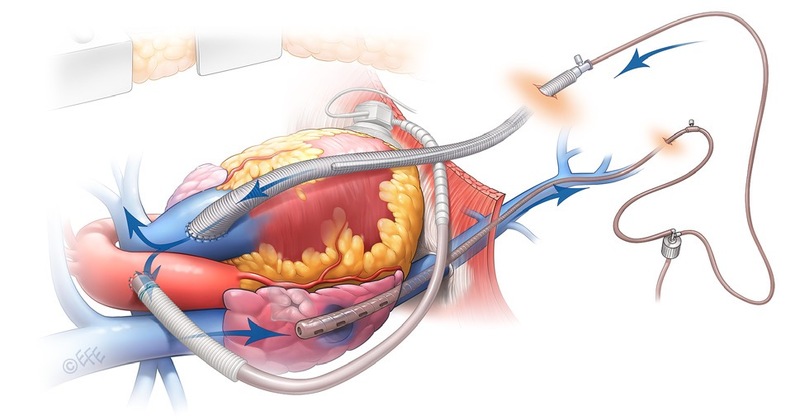 Temporary percutaneous right ventricular support using a centrifugal pump in patients with postoperative acute refractory right ventricular failure after left ventricular assist device implantation. Eur J Cardiothorac Surg. 2012; 41: 219-223. Ochiai Y, McCarthy PM, Smedira NG, Banbury MK, Navia JL, Feng J, et al. Predictors of severe right ventricular failure after implantable left ventricular assist device insertion: Analysis of 245 patients. Circulation. 2002; 106: I198-I202.